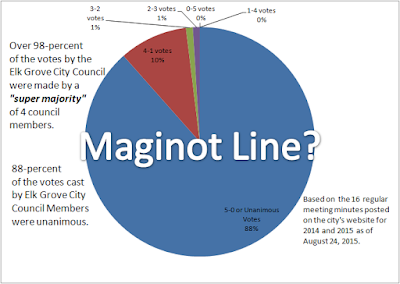 Is The 'SEPA Super Majority' Elk Grove's Maginot Line or an Illusion? During last week's special city council meeting, Elk Grove Mayor Gary Davis and Vice Mayor Pat Hume both reminded the public of the South East Policy Area's (SEPA) ironclad protections. Davis and Hume noted that any changes, or more specifically rezones, to the SEPA would require a super majority of the council. While requiring four of five members, or a super majority of 80-percent, of the Elk Grove City Council to approve any rezones or changes to the SEPA sounds like a tall task, how difficult would it really be? The best way to gauge that might well be an examination of the voting patterns of the city council. An examination of the 16 regular city council meeting minutes posted and accessible from January 2014 through yesterday revealed there were 103 individual council votes on public hearing and regular agenda items. It should be noted that on occasion, single agenda items require more than one vote. As you can see, once an item is placed on an Elk Grove City Council agenda, chances are it will be approved. While our analysis included only those items listed on official minutes, we can remember two additional split votes in recent years. Those votes were on the Walmart liquor license in 2013 and the June 2014, 2-3 vote killing Hume's idea to stop the pursuit of a professional soccer stadium with Fabian Nunez. (See video below). So really, when council members tout that the SEPA rezones will require a super majority, view the offering as Elk Grove's own Maginot Line protecting the city from suburban sprawl. A barrier that in theory is meant to keep marauding housing developers at bay, but in actuality is something they will easily by-pass with some cash donations. On second thought, maybe the Maginot Line is not the best analogy for Elk Grove's SEPA super majority. The French did build the Maginot Line with the best of intentions. The more appropriate analogy for the SEPA super majority is that is nothing more than an illusion. I trust our City Council to make the best decisions for our city. The reason all of the past votes have been 4-1 or 5-0 is because they were good projects for the city. I mean, look at the great city we have! I have all of the shopping I need; good variety of eating places; movie theaters; plenty of parks and trails; two freeways for access; car dealers; we have it all! If in the future, they decide that SEPA is worthy of a rezone, then I trust them to do it! “Those were the days my friend, we thought they never end!” But they did! For those of us around in the Elk Grove Planning Commission days of Pat Hume, Tim Murphy and Paul Lindsay, circa 2005, we didn’t get the standard deliberation as we do now with the Council, usually after Hume speaks, the typical, “I agree with my colleague.” Done deal! Back then on most land use and planning issues, and important ones to boot, we got bona fide deliberation on the majority of projects. We got diverse points of view, we got debate, we got them questioning each other’s rationale and forcing each other to make their points or they were left out in the cold with a little egg on their face. We got deliberative democracy! The public was listened to and questions were asked from those planning commissioners. Those PCs instilled a populist deliberative democracy amongst active citizens who spoke at the meetings, and they instilled authentic public comment into the process. Now I am afraid all we get is rubber stamp voting, the democratic element is gone, and what we have now is an elite democracy! But alas, Election 2016 is right around the corner! ROTFLMAO...obviously you have low expectations! I believe the first poster may have been Darren Suen. Just a guess.... sounds like him. Yes, it has become obvious that council takes their lead from the developers and a "super majority" really is an illusion, but boy it sounds good. We'll know how much crap this council has approved in 20 years, when we look back. It'll take awhile for the debris to be exposed for all to recognize. That's why they can say now they're bringing big business here and high paying jobs here. NASA is coming. Amazon is coming. Walmart, oh never mind. By the time we're able to call them on it and throw it back in their faces, they'll all be retired and living out of the area. Even if some "tree hugger" like Lynn Wheat somehow got elected, the developers would still have a 4-1 majority. Region Builders pays too much money to NOT own a super majority throughout the region. I find 4 of 5 of our city council nothing more than puppets of the developers and due to their inexperience they are not even aware of it. Just lining the developers pockets at the taxpayers expense and the developer is laughing all the way to the bank. It's so easy to see that happening if you have ever been involved in building and financing. Anon 22:40 Which one of the five isn't? They all seem to be naive and owned by the developers. I can agree our city needs a city employee who is an urban planner that leaders can stand behind and support. Not ever going to happen in this home developer driven city. Why? Because an experienced urban planner would focus on quality of life issues such as open spaces, better density plans, transportation, parks, architectural quality, drought tolerant landscaping etc. An urban planner spoke regarding the Souza Dairy Project and was not allowed to have extra time to speak. Remember who funds our leaders campaigns. Remember the "stakeholders" of our city translate to home developers....not those who live in the community. Personally I like Darren Wilson our Planning Director. But guess what? His experience is not in land use planning...he is a civil engineer. Big difference. Does this give you a sense of our city leaders? Pat Hume is the brightest and most articulate of council and at one time I believed the most fiscally responsible. (these days none of them are) However, I do not believe he has resident best interests in mind. If so after discussing water issues and saying something to the effect "Water is the new gold". He would not have approved 1000+ homes and a DA that forbids a building moratorium by the city. We will share our water with the new homeowners...and with a limited resource...it becomes much more valuable...and that translates we all pay more!